A great way to find more qualified LinkedIn profiles is to use x-ray (also known as site search or site:search). If you are going to use an x-ray search, changing your Google search from “All results” to “Verbatim” allows you to leverage Boolean Search Operations without any of Google’s personalized algorithm which results in you having greater control of your search string. I’ll be using the following base string leveraging Google Chrome as my browser. When I add Keywords (Accountant SOX “Greater Minneapolis-St. Paul Area”) to Google search, I get just over 4000 results. Using the same search string but selecting the “Verbatim” search option, I’ll get different results based purely on the keywords I’ve entered. Verbatim search is my go to when I’m searching for LinkedIn profiles that 1. Don’t have a large network 2. Have an incomplete profile or 3. Have a profile that is out of my network. Additionally, if I want to focus on a specific time frame or newly added profiles, Google does also offer a time filter. This is ideal for finding new profiles. In closing, you should always be asking if you’re getting the best search results. Using both a regular Google search paired with a Verbatim Google search will give you maximum results and an advantage over other sourcers. 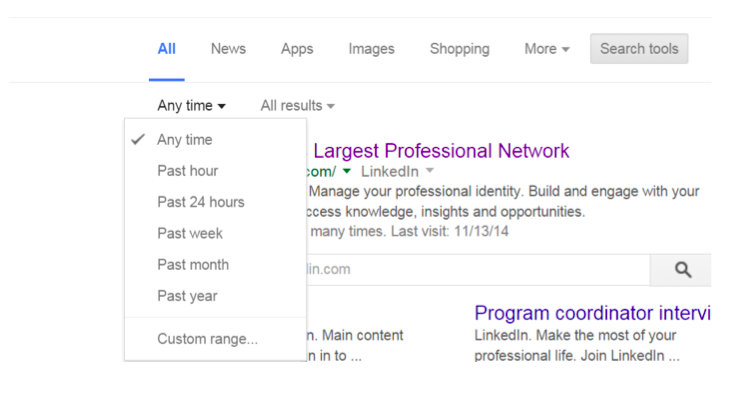 I often use my two favorite tools for developing great Boolean search strings when x-raying social media sites like LinkedIn, Google+, Twitter, GitHub, to name a few.